"Playing detective can be murder." So be careful if you don't know what you're doing. 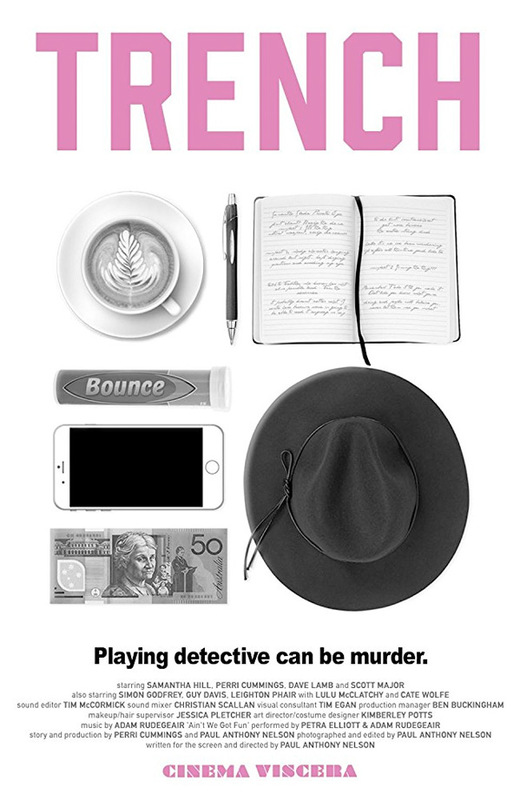 A trailer has arrived online for a microbudget comedy-noir feature titled Trench, the first full feature made by up-and-coming Australian filmmaker Paul Anthony Nelson. Set in Melbourne, the story follows a struggling comedian name Sam Slade who decides to pretend to be a private detective in order to pay her rent. She takes on the case of a reclusive writer being stalked in her own apartment. But they end up over their heads in mystery, doing their best not to end up getting killed along the way. Starring Samantha E. Hill as Sam Slade, with a cast including Perri Cummings, David Lamb, Scott Major, Lulu McClatchy, Simon Godfrey, Robert Davis, and Cate Wolfe. This definitely seems homemade without any budget, but might be fun to watch. Struggling stand-up Sam Slade (Samantha E. Hill) and reclusive writer Becky Holt (Perri Cummings) are thrown together when Becky experiences strange phenomena in her own home, and Sam, desperately broke, poses as a private eye - but will Sam's first case be the death of her? Trench is written and directed by up-and-coming Australian indie filmmaker Paul Anthony Nelson (you can also find him on Twitter @cinemaviscera), making his feature directorial debut after numerous short films previously. The script is written by Paul Anthony Nelson, based on a story by Perri Cummings and Paul Anthony Nelson. The film hasn't played at any film festivals yet as far as we know. Paul Anthony Nelson's Trench will be released in theaters sometime in 2017 or 2018, but no exact date is available just yet. Stay tuned. So who's interested?